Dr. J, Senior Vice President of Student Life, is one of BuckeyeThon's greatest supporters. BuckeyeThon is the largest student run philanthropy in the state of Ohio which raises funds and awareness for the Hematology/Oncology/Bone Marrow Transplant Unit at Nationwide Children’s Hospital. Students who support this organization work year-round to support the families and kids being treated at the hospital both emotionally and financially. 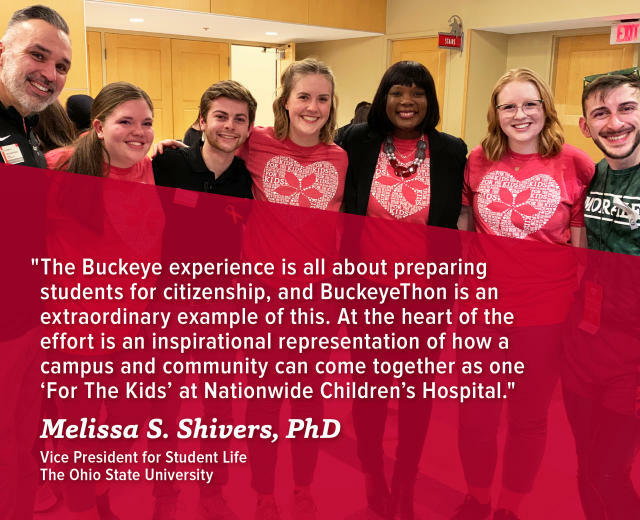 As a program of the Office of Student Life at The Ohio State University, BuckeyeThon engages thousands of students annually, fostering a spirit of philanthropy and uniting the Ohio State community to make a difference For The Kids.